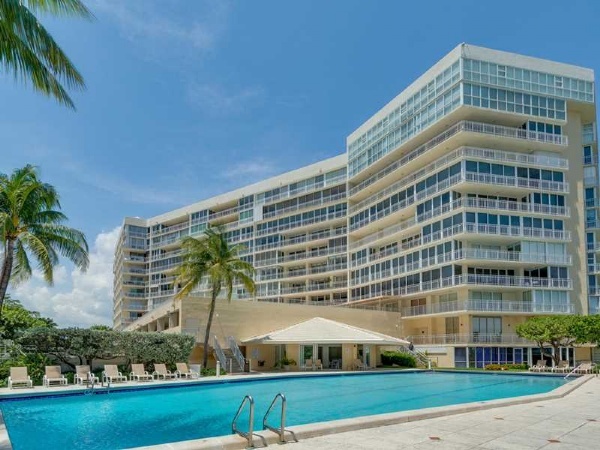 The eleven story Mar Azul in Key Biscayne is a triangular shaped building located near the southeastern side of the island, just north of Bill Baggs Park. The name of the building translates to “blue ocean” and it does indeed have a great position directly overlooking the Atlantic Ocean with completely unobstructed eastern views. The beaches of Key Biscayne essentially function as the Mar Azul condo's yard and you can walk along these coasts whenever the urge strikes. In addition to the direct beach access, you can play some tennis at Mar Azul or take a dip in the building's swimming pool. You'll find a fitness center and a community room as some of the additional amenities. The units of Mar Azul have two, three or four bedrooms and come with features like balconies and modern appliances, all within floorplans that emphasize space. The Mar Azul condo is also pet friendly. Walk to Bill Baggs Park or visit the L'Esplanade Mall to the northwest of Mar Azul. Village Green Park, the Ritz-Carlton, the Key Biscayne Shopping Center, Crandon Park, all of these and more don't require leaving the island. Thankfully, there is a roadway that provides direct access to Downtown Miami. Along the way you'll also find the Miami Seaquarium and Virginia Key.